THE STORY - M. Night Shyamalan brings together the narratives of two of his standout originals—2000’s Unbreakable, from Touchstone, and 2016’s Split, from Universal—in one explosive, all-new comic-book thriller: Glass. From Unbreakable, Bruce Willis returns as David Dunn as does Samuel L. Jackson as Elijah Price, known also by his pseudonym Mr. Glass. Joining from Split are James McAvoy, reprising his role as Kevin Wendell Crumb and the multiple identities who reside within, and Anya Taylor-Joy as Casey Cooke, the only captive to survive an encounter with The Beast. Following the conclusion of Split, Glass finds Dunn pursuing Crumb’s superhuman figure of The Beast in a series of escalating encounters, while the shadowy presence of Price emerges as an orchestrator who holds secrets critical to both men. THE GOOD - James McAvoy and Samuel L. Jackson deliver with rich performances for their flashy characters. A few sequences land well enough to at least maintain our interest considering there is a certain novelty to seeing these characters on screen once again. THE BAD - Repetitive themes, dull performances (outside of Jackson & McAvoy), more than a few questionable story directions & the burden of expectation makes this much anticipated culmination for M. Night Shyamalan yet another misfire in the director's filmography. ​​M. Night Shyamalan pulled a fast one on us with the 2016 release of "Split." We all went in expecting a tense thriller with a multi-layered performance from James McAvoy. What we didn't expect was for it to be a villain origin story and sequel to his 2000 film "Unbreakable." And now in 2019, we get the showdown between Bruce Willis' David Dunn and James McAvoy's The Horde in the writer/director's much anticipated "Glass." With "Unbreakable" and "Split" audiences walked in not knowing exactly what they were about to actually witness. However, with "Glass," M. Night Shyamalan finds himself in a situation he has not been in for over a decade: his new film actually has high expectations. However, this is the man who gave us misfires and atrocities such as "The Happening," "Lady In The Water" and "Avatar: The Last Airbender." So it should come as no surprise that "Glass" is the first great disappointment of 2019. I should say that I'm shocked but considering this director's filmography, I can't honestly say I am. Taking place 3 weeks after the events of "Split," David Dunn (Bruce Willis), along with his son Joseph (Spencer Treat Clark) are trying to track down Kevin Wendell Crumb, otherwise known as "The Horde" (James McAvoy). In his pursuit, David and Kevin get caught by the authorities and are thrown into a psychiatric hospital for the criminally insane. There, they meet Dr. Ellie Staple (Sarah Paulson), who has been given only a few days to try and convince the two extraordinary beings that they are not extraordinary at all. Once David realizes that he is not only being kept locked away with Kevin but also his old arch nemesis Elijah Price aka. "Mr. Glass" (Samuel L. Jackson), the situation becomes tenser as the seemingly sedated and now wheelchair bound Elijah has a few tricks up his sleeve, to still prove to the world that heroes and villains truly exist. Where "Unbreakable" straddled a fine line very delicately between questioning if superheroes could exist within the real world or if they were hopeful conjures from our own imagination, "Glass" wants to beat us over the head with this idea once again in the form Dr. Ellie Staple. Trying to prove that every idealistic hope we had about the first film and Dunn's true identity is all a delusion feels counterproductive to where M. Night Shyamalan could've taken this story as it feels like a retread over questions and themes we already explored in "Unbreakable." It also probably doesn't help that "Glass" is structured in a rather odd and peculiar way. The film wastes very little time in its first act re-introducing us to Kevin Wendell Crumb and David Dunn. We get some backstory on what happened to David's wife (This way the film can explain why Robin Wright is not in the film) and where he is at in his relationship with his son (The two run a security store together during the day while David fights crime at night as "The Overseer"). We get the much-anticipated confrontation between David and the Horde only a few minutes into the movie which feels rather anti-climactic. However, when we see what M. Night Shyamalan is building up to in acts 2 and 3, we remain hopeful that he is building to something grander and more epic in scale to what has come before. But this is all a red herring. The second act of "Glass" lingers on for far too long at Raven Hill Memorial, where very little happens and no new ground is covered by Shyamalan in regards to deconstructing the superhero genre. Everything plays out fairly predictably and the horror genre elements contained within "Split," which made that film a fun watch are sparsely utilized. Instead, we get a lot of dialogue, monologues and scheming from Mr. Glass which we think is building up to the ultimate showdown in the third act. Shyamalan attempts to subvert our expectations once again (As has become his norm in almost all of his movies) and brings us to a final confrontation that will leave you with more questions than answers. Suffice to say, without giving anything away, if "Unbreakable" was all about achieving one's full potential, "Glass" feels like a movie that takes all of that potential and wastes it. To what end exactly? I'm not entirely sure. What I do know is that half of my audience felt the ending was thoughtful and in line with the tone and themes the director started in "Unbreakable" where the other half (Of which I count myself a part of) felt cheated and left disappointed. "Glass" opts to keep a grounded, minimalist approach to its story and while it fits in with the same look and feel that Shyamalan brought to "Unbreakable" and "Split," it still can't help but feel cheap and unfulfilling considering the weight of expectation his fans are bringing into this one. Perhaps one day it will be re-evaluated by all of us and hailed as a great film like "Unbreakable" was. However, unlike that film, there is very little I find myself wanting to return to "Glass" for. Let's not be totally pessimistic. There are some good qualities to be found within M. Night Shyamalan's latest. James McAvoy is just as spellbinding as ever. Bringing us more personalities than he did in "Split," his performance as The Horde still ranks among the highest achievements the actor has ever bestowed upon us. His relationship with Casey Cooke (Anya Taylor-Joy) however, feels terribly misguided as it navigates through a Stockholm syndrome storyline that I never once could buy into. 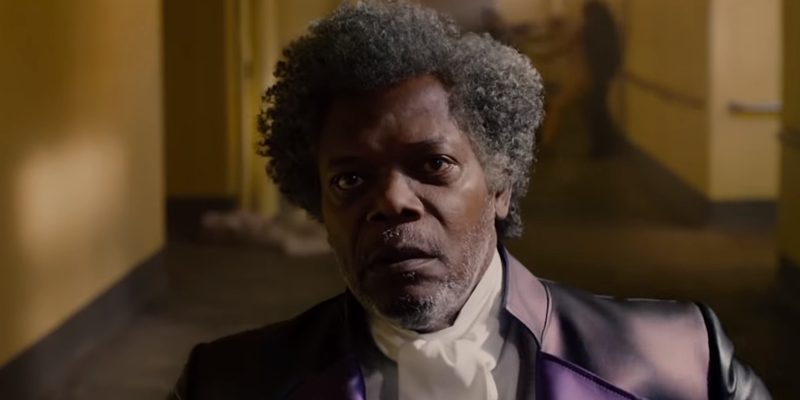 Samuel L. Jackson is a terrific amount of fun as always as the villainous Mr. Glass. However, Bruce Willis once again phones in yet another performance and does not come anywhere near to what he gave us in "Unbreakable" as David Dunn. For every off moment of dialogue that feels like it should've been left on the cutting room floor (Watch out for when one orderly talks about vitamins and water for some reason) and another needless cameo from the director himself (Providing a meta-commentary on his own career perhaps? You'll know when you see it), M. Night Shyamalan at least nails the visuals (considering the budget) and still knows how to create some tense and dramatic moments. But these moments are far too inconsistent and it's clear from the first few minutes that "Glass" is going to be yet another mess from the hit or miss director. Known for his twists, the ultimate twist this time was convincing us that his final film in what he now calls the "Eastrail 177" Trilogy would be his greatest achievement yet. Perhaps a better ending could've saved this one for me and although I can understand why others will dig it, I still can't help but wonder how this, after all of this time, was the best that M. Night Shyamalan could come up with?